Today is tax day. Despite President Trump’s signature tax reform, I ended up owing money to the feds for the first time in my adult life (although I’ll be getting a bit back from the State of South Carolina). The income tax used to be unconstitutional in our Republic. Indeed, the primary way that federal government gained revenue was from tariffs on imported goods and excise taxes on certain products, like whiskey. Alexander Hamilton advocated for high protective tariffs to protect young domestic industries from British manufacturers, who were “dumping” cheap British goods into the infant nation (a practice China has taken up today). Only during times of war, such as the American Civil War, did Americans have to endure a tax on incomes. Like most odious, liberty-killing measures, the income tax was a Progressive Era project, ratified in the 16th Amendment (followed shortly thereafter by the 17th Amendment, which made US Senators directed elected, and the 18th Amendment, which prohibited the manufacture, sale, and distribution of alcohol). Progressive reformers assured Americans that only a very small proportion of Americans would ever pay the income tax, which was graduated from the beginning. That claim was true… for the first year. Immediately, Congress began ratcheting up tax rates and requiring more Americans to pay it. Governments are hard-pressed not to exploit a newfangled method of raising revenue. The income tax is not all bad: it’s a more stable source of revenue that tariffs, which depend upon foreign imports. No imports, no taxation. Advocates for the graduated income tax, like Tennessee Congressman and future Secretary of State Cordell Hull, argued that, in the event of a major war in Europe (which broke out a year after the 16th Amendment was ratified), international trade would fall, bringing collected duties down with it. That was a prescient observation, and a strong argument in favor of some kind of domestic tax. That said, the income tax is incredibly invasive. Every year, I lament that the federal government has to collect so much information about me: where I worked during the fiscal year, how I saved my money, etc. According to Scott Rasmussen, 52% of Americans favor repealing the 16th Amendment. Count me among them. The income tax gives the government far too much influence over our lives, and the federal tax code is so byzantine and full of carve-outs and exemptions, it’s become the purview of the well-connected. It’s become a corporatist monstrosity. What would replace the income tax? Given that it’s likely never to be repealed—governments don’t typically diminish their power (or access to other people’s money)—the question is largely academic. Still, it’s worth considering. While I think tariffs can serve a useful purpose (see also: bringing China to heel), and that there’s an argument for some mild protectionism, high protective tariffs like Republicans championed after the Civil War would be ruinous to trade. The deadweight loss (destroyed economic activity) associated with tariffs—especially from the inevitable retaliatory tariffs other nations would pass in response—would do more harm than good, and could result in a Smoot-Hawley Tariff of 1930 situation (i.e., the Great Depression). The only realistic alternative that I see currently (from my admittedly myopic position) is a national sales tax. There are some serious drawbacks to this approach, to be sure, but it would be the cleanest, most efficient way to generate revenue. A national sales tax would encourage saving and work, both of which are currently disincentivized under our current tax regime. Instead, purchases would be disincentivized, which would hurt sales, but encourage people to hold onto more of their money. Further, it would not require the government to keep elaborate tabs on every worker; the Internal Revenue Service could be greatly reduced, or even eliminated. Of course, any tax is a necessary evil, and a national sales tax would make it more difficult for high sales tax States to raise revenue (as it would limit those States’ ability to increase their taxes if necessary). It would also slow purchasing, and necessarily raise prices (by definition, especially if you’re tacking 15-25% on top of a good). There’s also the question of whether a sales tax should just apply to consumer goods, or if it should be an uber-expensive value-added tax, with each economic transaction along the chain of production getting taxed. Those are sticky questions for wonkier types than I to sort out. But wouldn’t it be nice to build an economy on the production of real value—of stuff—rather than one built on ever-expanding sales, purchasing on credit, and debt financing? Regardless, the federal income tax is a major imposition, an invasive intruder that enters our lives every April, borrowing from us (without interest!) throughout the year, and intimidating us with the looming threat of disruptive audits. It seems everyone would be happier—even, in a way, the feds!—if it were eliminated. It’s been a good weekend, and today’s post marks another milestone in this blog’s brief history: fifteen weeks of consecutive daily posts. After a change of pace last Sunday, I’m back to Lazy Sunday. This week’s edition looks back at posts about the administrative Deep State that exists in the federal government. Indeed, it’s an unholy alliance of D.C. insiders, corporate elites, academic Leftists, and social justice warriors, all arrayed against President Trump and his agenda. The Deep State is, as I’ve written, very real. We can no longer trust judges to dispassionately rule on or uphold the Constitution; bureaucrats to execute faithfully the president’s orders; or government officials to act in the best interest of the American people. Further, we cannot trust our elites to even abide by the outcome of a fair, free election. The long, expensive Mueller probe represented a vague, politically-motivated witch hunt, all designed to de-legitimize President Trump. That our unelected intelligence agencies played an active role in such treasonous activity further highlights the dire situation in which the Republic finds itself. Indeed, we’ve entered into a period of praetorian rule in the United States. No longer is the Constitution respected. If the people make the “wrong” choice for president, then the full apparatus of the Swamp will swing into action to “correct” the wrongthink of the plebes. Most Americans do not appreciate how far we’ve passed through the looking glass. I would urge President Trump to restructure radically our intelligence agencies, making them accountable to elected officials and, therefore, the American people. These posts detail the perfidy and duplicity of the Deep State. They only scratch the surface. 1.) “Fictitious Frogs and Bureaucratic Despotism” – this piece examines, in brief, the excesses and abuses of federal agencies that have been delegated lawmaking powers. Weak-willed Congress’s have readily given up their precious legislative powers, and out-of-control justices have approved this unconstitutional, cowardly activity. The results have been both absurd and catastrophic, particularly with everyone’s favorite government-agency-to-hate, the Environmental Protection Agency. 2.) “The Deep State is Real – Silent Coup Attempt and Andrew McCabe” – disgraced Deputy Attorney General was going around bragging about his attempt to lead a 25th Amendment removal of President Trump from office, premised on the ridiculous notion—unfortunately axiomatic among Leftists—that the president is insane. Despite no evidence to suggest as much, McCabe, like other Deep States progressives, merely wanted to remove the president from office. Of course, to progressives, anyone who disagrees with them is either mentally ill or evil. 3.) “The Deep State is Real, Part II: US Ambassadors and DOJ Conspired Against Trump” – this post kicked off a few days of Deep State reflections. It’s a “must-read,” as I explain how the notorious Steele dossier, a fake document used to obtain a FISA warrant to wiretap the Trump campaign phones, was commissioned by the Clinton campaign. With all the claims of “Russian collusion” levied at President Trump, it’s an absurd example of projection: Clinton was the one “colluding” with a foreign agent (Christopher Steele, the author of the dossier, is a former British spy) to influence the outcome of an American election—and using the backchannels of state power to eavesdrop on an innocent man’s presidential campaign. That’s far more sinister than anything the Nixon campaign did in 1972 (at least the Committee to Re-Elect the President kept the Watergate burglary domestic). Secretary of State Hillary Clinton should be in federal prison. 4.) “Mueller Probe Complete, Trump Vindicated” – remarkably, even Robert Mueller couldn’t straight-up lie about President Trump. I’ll end this Lazy Sunday on a positive note: President Trump was cleared of any “collusion” with Russia (keep in mind, “collusion” isn’t even a legal term, and is vague to the point of meaninglessness, which is the point: anyone can read into the phrase “Russian collusion” whatever dark fantasies they want). Now that the probe is done, President Trump should act with all haste to DRAIN THE SWAMP! Happy Sunday. Rest up—we’ve got to take back America! A bit of a late post today. There’s no good excuse—after a productive Friday afternoon of grading and errands, I indulged in a decadent, three- or four-hour gaming session with the new Civilization VI expansion, Gathering Storm. The verdict so far: dynamic weather events are fun, and the World Congress is interesting, but it doesn’t seem like $40 worth of new material. I am, however, enjoying colonizing Australia as Phoenicia. But I digress. This morning the Florence County (SC) GOP held its county convention, an event that occurs every two years. I’ve moved out of the county, so this convention marked a transition for me: the end of my formal involvement with the group as Secretary and an executive committeeman. It was a great convention, with none of the squabbling or jockeying or tedious proceduralism of the first FCGOP County Convention I attended six years ago, in 2013. It was a different world back then in many ways, what with the different factions of the Right trying to come to terms with another bitter presidential loss, each little group blaming the other. There were the “professional” pols, what we might call the “Establishment” Republicans, who dominated the writing and amending of by-laws; these were the folks that used by-laws like a bludgeon, catching people in procedural traps and using every trick in the book to achieve their agenda. On the other hand, you had an active T.E.A. Party contingent, the upstarts trying to get a slice of the county pie. And then you had folks like me, coming in fresh and confused, just trying to get involved. Indeed, it was at that county convention in 2013 that I was elected Third Vice Chair of the FCGOP, a position responsible for youth outreach and development. If you’ll indulge me, there’s a mildly interesting story about how that came about. I’d attended precinct reorganization a few weeks prior to the convention. That’s a major process that every county party in the United States goes through every two years, in which the party reorganizes as many precincts as possible, thereby reconstituting its executive committee It’s a process that’s not well understood if you’re not in the GOP, but it’s fairly simple: you show up and organize your precinct, which means electing a president (who, in theory, organizes volunteers to campaign in the neighborhood) and an executive committeeman (who serves as part of a kind of “board of directors” for the county’s party). Anyway, the weekend before the convention, the sole candidate for the 3VC position backed out, apparently because of withering comments that he was too young to do the role justice (the fact that he backed out for that reason demonstrating they may, in fact, have been correct). As such, there was no one running going into the convention. Upon arriving at the convention, I floated the idea to a friend of mine (who would go on to become the Party Chairman a few short years later, and, as of today’s convention, the State Executive Committeeman for Florence County) of running to fill the position. I’m a teacher and enjoy working with young people, and if there was no one to fill the role, why not give it a shot? He agreed to second my nomination if I could find someone to make the initial nomination. In the meantime, one of the “professional” types in the Party approached me, saying he’d heard I was interesting in running for the position. He then said that “they” had a candidate picked out, and not to worry about it; that, instead, I could get involved in the fall in some other capacity. The way he approached me—and the fact that some shadowy group had their own pony they were trying to set up to win—made this dark horse all the more determined. What started out as “I want to serve” became, quite quickly, “Now I have to run out of principle.” Even if I lost, I didn’t want heir-apparent waltzing into the position. So, I made a beeline for the one other person I knew, an elderly man I’d met at precinct reorg a few weeks earlier (I was from the 12th precinct, he from the 11th). He happily agreed to nominate me (he would later be expelled from the GOP for publicly endorsing a Democrat in a local election). It came time for nominations, and my folks came through for me (albeit in reverse: my elderly friend seconded the nomination, and my destined-for-greatness buddy ended up nominating me, as I recall). Then, there were other nominations—for the young man who’d pulled out of the race! The third candidate—the one “they” had picked—was never nominated (I found out later that he pulled his name from consideration once he realized he’d have to run against someone). With a competitive race, we had to give speeches. Recall, I’d come into this convention blind, not even sure if I was going to run. I had to craft a compelling, quick speech on the fly (as this blog attests, brevity is not my strength). I introduced myself to the convention, mentioned my experience teaching, and said that my opponent was far more knowledgeable of the Party’s mechanics than I was, and would do well. When it came time for him to give his speech, he simply said, “I decline the nomination.” I was actually quite disappointed here. I was hoping he’d give it a shot, and we’d have a fair vote. But that statement cemented that, indeed, he was probably not ready for a leadership position (as I recall, he was quite young). There was also a whiff of loafer-lightened melodrama to his withdrawal, but I can’t say for sure. Fortunately, there were no such behind-the-scenes shenanigans. Every officer was nominated and elected unanimously, with a strong slate of leadership to continue the FCGOP’s impressive growth. After that, I headed to the Darlington County GOP’s precinct reorganization, so my little precinct in Lamar is now organized. I met a few folks and starting making some connections. I met a lady who taught at the school where I currently work years ago, before her children were born; I also talked to a Convention of States guy about that concept (a topic for a future post, perhaps). All in all, I met several nice people, with whom I look forward to building up the DCGOP. That’s pretty much all politics is: talking to people, building relationships, and getting those folks to vote. Charles Norman at Taki’s Magazine has a piece entitled “A Secret History of Right-Wing Rock Stars“; it’s definitely worth a read over your Friday morning breakfast. As a musician, I often experience the common assumption that I’m automatically a Leftist. I remember a former Fine Arts colleague expressing shock when she learned I was a conservative Republican; a music teacher in a comedic power pop band couldn’t possibly be conservative! Another anecdote: there’s a group of poets and far-Left activists in Columbia who host a weekly poetry open micweekly poetry open mic, for which I’ve played as the featured musician a number of times (they have a featured musician play a short set, then a featured poet, then open it up to all comers). They’re a mix of aging Boomer hippies—the ones that never quite cleaned up and became striving yuppies in the Eighties—and radical chic SJW college kids. Twice now, I’ve opened for a transgender “woman” who “transitioned” from being a man; pretty much all of her “poetry” consists of angry screeds against the doctor who shouldn’t have “looked between my legs, but within my heart” when he was born. The last time I played for them was around June 2017. I was in the midst of a songwriting dry spell, and told the host as much. He said (to paraphrase), “how could you not be artistically motivated in this political climate, with this president?” He was clearly energized in opposition to President Trump, and assumed I would be as well. The point of that story is that, despite my very public expression of my political and social views in this medium and others, these folks just assumed I was one of them because I’m a flamboyant performer with funny songs. Of course, as I wrote last Friday, I try to keep my politics out of my music to the extent possible. Mission accomplished, I suppose. But I digress. Many musicians I know are left-of-center, even here in the rural South, and artistic types often buck up against whatever the prevailing cultural norms are. Of course, in our age of culturally dominant progressivism, not expressing cloyingly simplistic statements like “love is love” or “hate has no home here” is itself an act of rebellion. As Gavin McInnes says, being conservative is punk rock. As such, Norman’s piece was eye-opening and interesting. It really is a “secret history” of not-so-secret, but oft-forgotten, conservatism among post-war rockers. Norman focuses on Brit rocker Morrissey of The Smiths, who I’ve always perceived of as some kind of icon for jaded Gen X-ers and “Born this Way” homosexuals. But ol’ Morrissey has made waves lately with some controversial comments about foreigners and Muslims. Norman points out that writers, eager to shoe-horn Bowie into their own political cosmos, try to explain away Bowie’s political views as “strange”—that is, the innocent follies of a wacky artiste, not to be taken seriously. That’s the approach taken in a lengthy Politico piece on Bowie’s politics. So, were Bowie’s unorthodox political views the follies of artistic youth? He backpedaled hard later in life—prudent, if you’re linked to fascism, and not unlike Democrats renouncing their former Klan membership—and probably did denounce those ideas. Does it matter? David Bowie wasn’t trying to get anyone killed. He made a lot of great music that brings everyone together (that comedic power pop band I mentioned earlier, The Lovecrafts, was united musically by one shared influence: the Thin White Duke). Music is for everyone. There is an odd comfort in knowing that some of the greatest rockers of the twentieth century supported immigration restrictionist MP Enoch Powell. Otherwise, just enjoy their musical output. Monday’s post, “Symbolism and Trumpism,” looked at the importance of unifying symbols, and how our interpretations of those symbols derive from our local experiences. While Trumpism is a nationalist movement, it is one infused with localism—the more parochial form of federalism. Local identity—and rootedness to a place—is crucial in building investment in one’s nation. Indeed, I would argue that localism is key to building a strong nation. People need personal and emotional investment in their communities. That means the ability to make a living and support one’s family where one finds oneself. Unfortunately, we tend to emphasize the importance of national politics, while knowing very little about local and State politics—the level that can really affect our lives day-to-day. Yes, the federal government and its power are cause for concern, and we should keep a close eye on it. But the reason it’s grown to such gargantuan proportions is because we’ve delegated greater powers and responsibilities to it, rather than doing the hard work of governing ourselves and learning about our local politics. Yesterday was election day in Florence, South Carolina, and in other localities throughout the state. Specifically, there were a number of primaries, both Democratic and Republican, for various local and statewide seats, including an exciting State Senate race for my district, SC-31. That race saw a long-serving incumbent, Senator Hugh Leatherman, face challenges from local insurance agent Richard Skipper and current Florence County Treasurer Dean Fowler, Jr. This race was of particular interest because of the huge sums of money spent on it, as well as Governor Nikki Haley’s injection into the race (she endorsed Richard Skipper). Ultimately, Senator Leatherman retained his seat for another term (he’s currently been serving in the SC State House and/or Senate for thirty-six years) handily, with a respectable showing from Mr. Skipper. For all that time, money, and effort, 10,953 voters cast ballots (according to returns from WPDE.com). 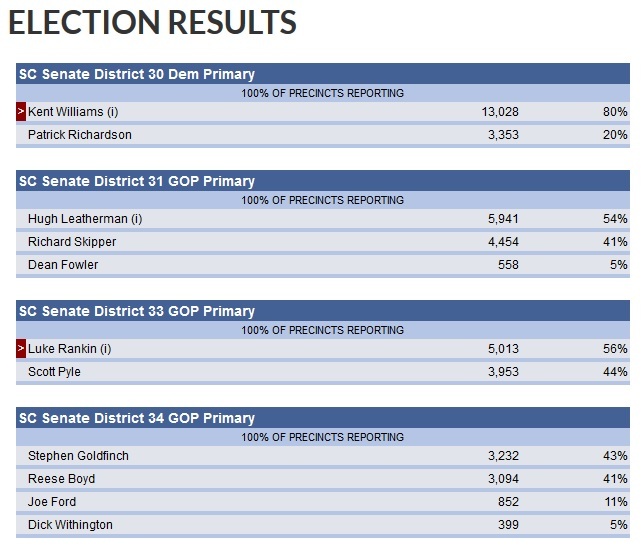 In essence, those voters picked the State Senator (as there is no Democratic challenger, Leatherman will run unopposed to retain his seat in November). I don’t know the exact number of eligible voters in SC-31–it’s a strange district that includes parts of Florence and Darlington Counties–but I would wager there are far more than 10,953. Turnout for primaries, especially off-season and local ones, is typically very low. Voters in these primaries tend to be more involved politically and more informed about local politics… or they happen to be friends with a candidate. It’s often said that politics, like much else in life, is all about relationships. This quality is what gives local elections their flavor, and what keeps candidates accountable to their constituents. In other words, it’s usually good that we know the people we elect to serve us, or at least to have the opportunity to get to know that person. In the late 18th and early 19th centuries, Americans often knew very little about the goings-on in the nation’s capital. Washington, D.C. was largely seen as a distant, almost alien place that served an important role in foreign policy and in times of national crisis, such as war, but few people followed national politics too terribly closely. Indeed, even presidential candidates were nominated by state legislatures or party caucuses, and were elected at conventions by national delegates (as opposed to the current system of “pledged delegates” that exists in conjunction with democratic primaries). Instead, most Americans’ focus was on local and state politics, because those were the levels of government that most affected their lives. Today, that relationship is almost completely inverted. Due to a complex host of factors–the centralization of the federal government; the standardization of mass news media to reach a national scope; the ratification of the XVII Amendment and the subsequent breakdown of federalism–Americans now know far more about national politics than they do local or statewide politics. At the local level, though, Americans can have a great deal of impact–they can more easily talk to their city councilman than their congressman (although I would like to note that SC-7 Congressman Tom Rice is one of the most accessible and approachable people I’ve ever met). Let’s follow the trends in dining and shopping and go local. Learning more about local politics is healthy for the body politic, and is one small but effective way we can begin to restore the proper balance and focus between the people, the States, and the federal government. 101 Postmatians – 101st Consecutive Daily Post! Perhaps it’s a bit odd to celebrate grinding diligence, but I’m proud of myself. Yesterday’s post on model bills (a bit of a snoozer of a topic, I’ll admit) marked the 100th consecutive daily post on this blog. I realized in late December 2018/early January 2019 that WordPress tracks streaks once you hit three consecutive days of posting, so I decided to see how long I could keep the momentum going. Initially, I was just going to try to get through January. It’s a slow month in the academic year, a rare moment when I have a sliver of extra time to devote to extracurricular hobbies, like music. Of course, the more I wrote, the easier it became to churn out posts on any number of topics. Pretty soon, I’d gotten to fifty posts. Despite Internet outages (within weeks of each other, both times because a Frontier technician incorrectly disconnected my line), I was able to get some posts up (even if they weren’t of the best quality). So, to celebrate, I thought I’d take today “off” with a classic retrospective (which I already do once or twice a week with “TBT Thursdays” and “Lazy Sundays“)—a written “clip show,” if you will, of The Streak ’19’s Top Five Posts (so far). 1.) “Hump Day Hoax” – it seems these local stories do well (my piece on the fight at the Lamar Egg Scramble has turned up in quite a few searches; I’m still trying to find more details about it). This piece was about the Mayor of Lamar’s claim that her car was vandalized in a racially-motivated attack, and she expressed relief that the vandal didn’t try to kill her and her husband. When the Darlington County Sheriff’s deputy came out to investigate, he discovered the mysterious yellow substance was pollen! That didn’t prevent it from making national news, getting a mention in Newsweek. At first, I thought our mayor was just trying to get some cheap PR and sympathy for herself, but after discussing it with some other folks, the consensus seems to be that she suffered from stupidity, filtered through a conspiratorial, black victim mentality. Rather than see the sticky substance for what it was—the ubiquitous pollen that covers our fair Dixie—the mayor’s first thought was a racist attack. That’s a sad way to live. As I wrote in this piece, the mayor is a sweet lady, and I think she really wants to do her best to help our little town. That said, this kind of ignorant hysteria doesn’t help anyone or anything, much less race relations. 2.) “Secession Saturday” – boy, this post generated some views. The focus of this post was a piece from American Greatness, “The Left Won’t Allow a Peaceful Separation,” by Christopher Roach. It explores whether or not some kind of peaceful parting of ways between America’s two cultures—traditionalists and progressives—is desirable, and revisits questions the American Civil War resolved—at least for a time—with force of arms (“do States have the right to secede?,” for example). A panicked former student texted me in anguish, worrying about a Civil War II, after seeing this post on Facebook. I tried to allay her fears. But the real point of my commentary was on the idea that the Left is fundamentally totalitarian, and will broach no disagreements. That’s a key insight Roach and others make, and it’s why I reference back to his piece so frequently. Of course, it also helped that I linked to this guy in the comments of a more successful blog. 3.-4.) “Nehemiah and National Renewal” & “Nehemiah Follow-Up” – these two posts came amid a week in which I found myself immersed in the Book of Nehemiah (one of my favorites in the Old Testament, as he builds a wall to renew his nation). The initial post sparked some great feedback from Ms. Bette Cox, a fellow blogger (who, incidentally, preceded me in my soon-to-be-vacated position as the Florence County [SC] GOP Secretary). She astutely pointed out that my first post missed a key point: in Nehemiah 1, the prophet falls to his knees and asks for God’s Will. Nothing bugs me more than when I’m out somewhere, having a conversation, and someone thrusts a phone in my face with a YouTube video. I’ve actually told my friends that if they do this, I will refuse to watch it. It’s not that I don’t want to share the joke with you; it’s that you’re making me watch a video on a cellphone! C’mon. I can barely hear the dialogue (or song, or whatever) on your tinny, bass-less phone speaker. Furthermore, can’t we have a conversation without resorting to SNL clips? But I digress. I made an exception for Tucker Carlson’s powerful monologue about our frigid, uncaring elites. I’ve definitely jumped on the Carlson populist-nationalist train, and I think he makes a compelling case for preserving—or, at least not actively destroying—small towns and the families they nurture. So, there you have it—a lengthier-than-planned reheating of my posts during The Streak ’19. Thanks for all of your love and support. Here’s to another 100 posts! I came across this expose from USA Today about model legislation, the practice of a think-tank or industry lobbyist writing legislation that can be introduced in copy-cat form across multiple States. It argues that this “copy-paste” approach to legislation undermines democracy and benefits corporations. It’s not fair introduce legislation this way because…? Sure, we should want engaged legislators working on our behalf. But lobbying for legislation isn’t anything new, and it would make particular sense for a think-tank to write up a generic version of a bill that could be adapted to different States’ local conditions. If anything, I don’t want legislators dreaming up too many new laws: who knows what wacky stuff they’d produce? As for the misleading bill titles, isn’t this true for most legislation? The “Affordable Care Act” didn’t make healthcare any more affordable. In fact, it didn’t have anything to do with health care, per se, but health insurance. For that matter, newspapers routinely publish misleading headlines, the articles of which often contain the exact opposite meaning of what the headlines blare. The USA Today piece looks at several pieces of legislation, including various “right to try” bills, a national version of which President Trump ultimately signed into law. That law allows patients with severe medical conditions to try drugs that aren’t yet tested. That’s a brilliant piece of legislation; why wouldn’t you want that copy-pasted to every State in the Union? The piece notes that corporate lobbying groups use this “model bill” approach the most, followed by conservative groups. It makes sense that conservative groups would focus on their advantage in State legislatures around the country, rather than trying their luck with Congress; it’s also consistent with conservatism’s emphasis on federalism. The only model bill that seemed unethical in the piece was one involved shielding companies from mesothelioma lawsuits. The bill’s name misleadingly suggests it’s about protecting against asbestos, when it’s really designed to pay mesothelioma sufferers out of an asbestos trust before they can file suit against a company. USA Today breathlessly points out that most victims of the condition succumb in under a year, and don’t get a chance to get their money. With all respect and love to the folks suffering from mesothelioma, I’m not exactly losing sleep over a bill that seeks to limit ambulance-chasing litigation. What’s wrong with being paid from an arbitration pool? Regardless, while the piece is interesting—it’s worth a skim—it’s the same kind of breathless, pearl-clutching, “democracy-dies-in-darkness” pabulum that the media loves to serve up. If model bills benefited progressive policies, would they be causing such a fuss? Yes, we should hold our elected officials more accountable, and expect them to do their due diligence. If they’re approached with one of these bills, they should read it carefully, and weigh it against the needs and desires of their constituents. Otherwise, this model bill situation seems like a non-issue, or only a very minor one. My takeaway: trust, but verify. Blogger photog at Orion’s Cold Fire often links to noteworthy pieces on American Greatness, the premiere blog for the Trumpist Right. American Greatness does real yeoman’s work to articulate what Trumpian conservatism is. Kevin Williamson, you’ll recall, is the house globalist/libertarian for National Review (despite a brief, one-article stint at The Atlantic). In 2016, he infamously wrote that “dysfunctional, downscale communities… deserve to die.” He argued that communities like Garbutt, New York—a gypsum boomtown in the nineteenth century that ran its course when the gypsum was gone—have outlived their economic usefulness, and its inhabitants should move elsewhere for opportunity. There is something to this perspective, but, as Tucker Carlson eloquently noted in an exchange with Ben Shapiro, the neoliberal order and its notions of economic mobility are hugely disruptive to communities. Families are told, essentially, to leave behind their grandparents’ graves, their Little League teams, their memories, in order to work in service to the gaping maw of some efficiency-maximizing corporate conglomerate. What Trumpism understands is that, while economies are dynamic, they require strong communities and stable families to maintain. So it is that Robin Burk argues that Williamson’s libertarian approach lacks any sense of a narrative or symbols. Williamson is testy because Trump is planning a big military parade (and, presumably, because Trump has been a far more effective advocate for conservatism than Williamson’s angry brand of libertarian orthodoxy). It seems like wasteful agitprop to him. What Burk explains in her piece, however, is that a common people need some unifying symbols. That’s why the NFL National Anthem controversy revealed such deep splits in our culture. It’s why Americans don’t particularly like it when protesters burn the American Flag. Yes, it’s constitutional, but that doesn’t mean it’s good—and it’s the literal destruction of one of the most unifying national symbols. Burk’s focus is more on the local, though, and it’s what makes her piece so interesting. Communities are built between friends and neighbors. Yes, the mills shutdown, and some people have to move to look for opportunity. The mills shutting down also mean some people lose their way, and resort to opiates to numb the pain. But not everyone can or wants to become economic mercenaries, shifting about rootlessly in search of the highest bidder—or just a job, for that matter. Some folks want to build a life and a community where their ancestors did. The implication from neoliberal and libertarian types is that, at best, that desire is unrealistic; at worst, it’s bad: your loyalty should only be to efficiency! Efficiency is morality! While I love efficiency as much as the next cog, efficiency-for-its-own-sake is not and should not be our god. As Carlson puts it (to paraphrase), we shouldn’t work for capitalism; capitalism should work for us. Burk adds that we need symbols, formed from and interpreted by our individual experiences and memories, to create a society that fosters the good life. This weekend my adopted hometown of Lamar, South Carolina (home of that great, racist, yellow peril, pollen) hosted the annual Egg Scramble Jamboree. It’s a festival that attracts around 7000 people to the town, increasing its population by about 700% for a day or two. The festival is an opportunity to celebrate spring—it includes a lawn judging competition, which is the most American, Hank Hillian kind of small town contest—and to generate some tourism dollars. It’s unfortunate, then, that the Scramble cracked up last night due to a fight. I was out of town for the Egg Scramble, but I wanted to see if there was any news about it this morning. That was not the headline I was expecting. Perhaps I’m indulging in a bit of mountain-from-mole-hill building, but it seems like more and more disruptive outbursts are occurring in the public square these days. According to the news item linked above, this fight marks the first time law enforcement had to shut down the festival since its inception in 1983. What led up to that fight? Was there a general atmosphere of mob-ishness that led Darlington County sheriff’s deputies busting up the festivities? Was the “fight” a general brawl? How did an isolated kerfuffle lead to the drastic decision to shut down the entire event? In our current age of litigiousness and excessive concern for safety, it would make sense to send festival-goers home: avoid any lawsuits from personal injury vampires. It seems, too, that authorities would be concerned about a donnybrook devolving into an all-out brawl. Regardless, it’s a shame how a handful of hooligans can disrupt everyone’s good time. That’s the price of petty crime and social disruption: a major economic stimulus and good, clean fun are destroyed because some people can’t keep their composure at an egg-themed community event.